In this project, I conceptualize and apply digital decolonizing methodologies for learning about Native and Indigenous peoples uses of social media. 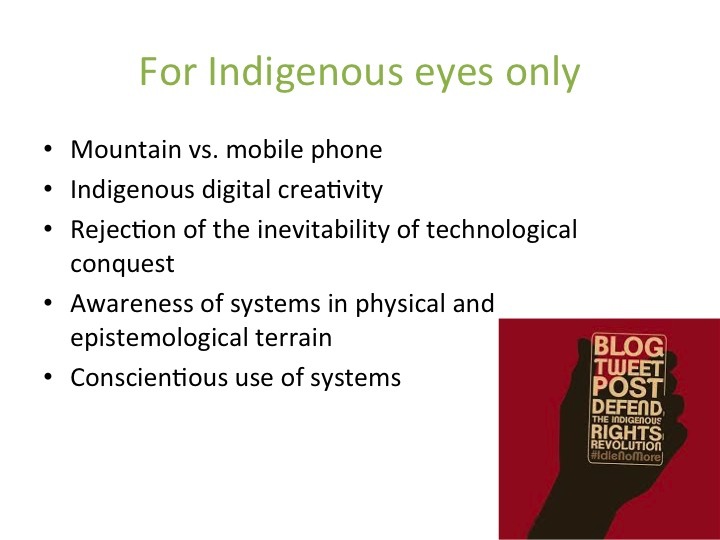 Findings reveal the need to develop methodologies that can account for the limitations and affordances of specific social networking platforms with regard to Native and Indigenous peoples access to digital devices, and within the context of Native modes of sociality. The goal of this project is to discern characteristics of the networks of networks shaping Native peoples efforts at using social media for political participation, engagement, and mobilization. This project is also allowing me to share knowledge about ICTs and social media protest with activists and organizers. Duarte, M.E., (2017) Connected Activism: Indigenous Uses of Social Media for Shaping Political Change," Australasian Journal of Information Systems, 21. Reference: Roy, L., Duarte, M.E., Gonzales, C, Peters, W. "Social Media: Extending the Boundaries of Indian Country," Handbook of North American Indians: Introduction (Volume 1), edited by Krupnik, Archambault, Ha, and Holton. Washington, DC: Smithsonian. Forthcoming. Reference: Vigil, M., Duarte, M.E., Deschine-Parkhurst, N., Belding, E. "#Indigenous: Tracking the Connective Actions of Native American Advocates on Twitter," 20th ACM Conference on Computer-Supported Cooperative Work and Social Computing (CSCW 2017), February 25-March 1, 2017, Portland, Oregon. 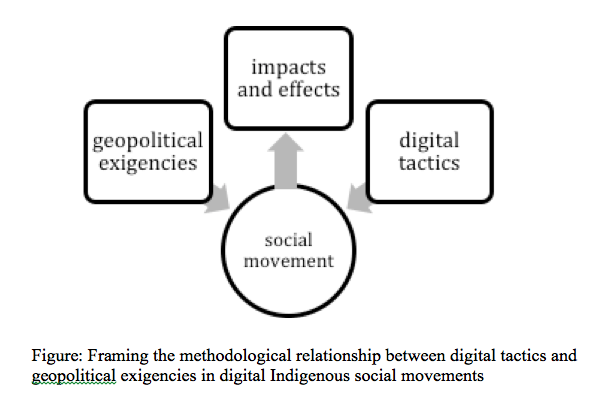 Reference: Duarte, M.E., Vigil-Hayes, M. (2017) #Indigenous: A Technical and Decolonial Analysis of Activist Uses of Hashtags Across Social Movements," Mediatropes (Indigenous Matters: Cultures, Technologies, Mediations) 7, 1: 166-184. Reference: Duarte, M.E. (2018) "Corporate Hegemony and Information Integrity: A Challenge for Native American Activists Relying on Social Media," Native American and Indigenous Studies Association (NAISA 2018), Los Angeles, California, May 14-19, 2018. "Framing Digital Indigenous Social Movements"
Image in "Connected Activism: Indigenous Uses of Social Media for Shaping Political Change"